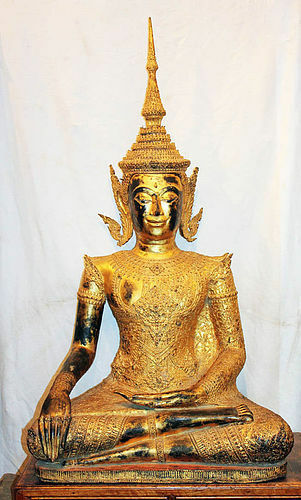 Monumental lifesize gilt bronze buddha, Tailand, Bangkok Period, late 19th. century AD. The buddha is seated on a low podium in a finely adorned dress and with elaborate details and ornaments, all finely gilt. Size: 113 cm. high and ca. 65 cm. wide. The weight of the buddha is likely around or more than 100 kilograms. Blackstone stele of Surya, The Sun God, Pala period, 10th-11th cent. A BLACKSTONE STELE OF SURYA THE SUN GOD, Pala period, 10th.-11th cent. 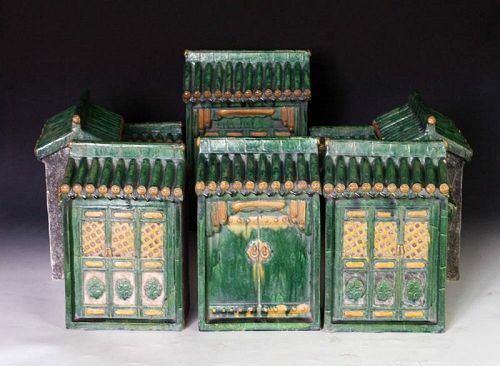 A truely spectacular tomb pottery model of a rich court house or mansion, in the Ming Dynasty, 1368-1644 AD. We've seen and sold a few Court houses before and they have all consisted of 4 houses and 4 walls. This specimen consists of no less than 6 buildings and 4 pieces of wall. A massive seated figure of a Bodhisattva, carved from grey rock, likely Vulcanic, central Java, Indonesia. The figure seated with legs crossed and left arm resting in his lap and right arm on the knee. The figure wears a crown and other bodhisattva ornaments and sits on a double lotus throne. Massive important Buddhist Ming Dynasty bronze Buddha on lion! An extremely rare and impressive bronze figure of a young Buddha seated on a Lion, Ming Dynasty 1368-1644 AD. The Buddha is massive and heavy, even for the size, made in a bronze alloy now finely patinated with the typical uncleaned dark bronze tone. 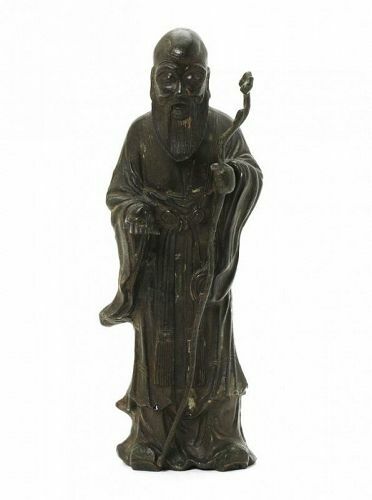 The figure is bald, clad in robes and with a serene facial expression. The Lion highly detailed and with a fearsome expression, engraved in the typical Ming manor. Interior is very encrusted and oxidated. Rare life-size Sino-Tibetan gilt bronze model of a Skull! A lifesize Sino-Tibetan bronze or cobber model of a Skull, later 19th.-20th. century. Made in solid bronze or copper, cast from a real skull and gilted with a very thick layer of gold. From Buddhist / Tibetan rituals. Possibly a model of an ancient skull, and likely made in the 20th. century. Size: 23,5 cm. long and ca. 18,5 cm. high from the jaw to the top of the skull. A rare and important large green Jade Cloud pendant, dating to the Chinese Hongshan culture. 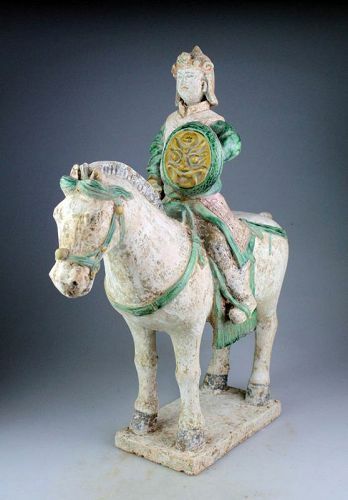 The piece has a provenance going back to the Cramer Collection from the 1930s and has a superb ancient patina with minor spots of calcification. Size: 87 mm. wide, and 86 mm. long, weighing 252 grams! 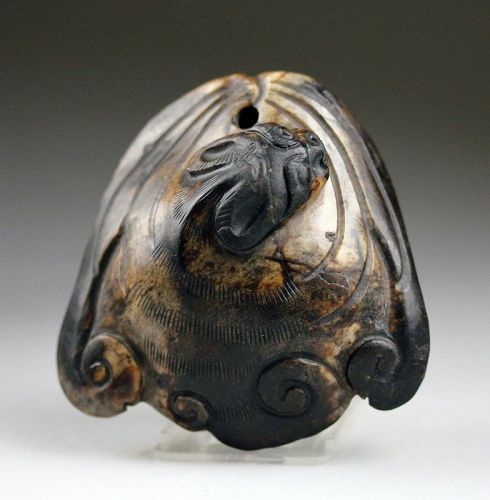 An important and very rare large Jade pendant, Zhou Dynasty, ca. 700-300 BC. From the Tony Lee collection: An amazing carving depicting a fantasy animal eating it's own tail. The animal with smaller details of head and body and looks like a mixture of a fish and a bird, perhaps a kind of a Phoenix/Dragon depiction. Conditionn: Intact, superb for the type. Lifesize Yuan-Ming Dynasty Chinese stone head - rare! Massive stone head of attendant, Yuan-Ming Dynasty, 13th.-15th. Century AD. With it's massive size, close to lifesize proportions and it's fine carving, this head is in very high quality. It depicts an imperial attendant with a high hat and a serene expression. Size: 38 cm. high 25 cm. deep and 27 cm. wide. With the finely made costum base, 63 cm in total. Condition: Choice! Wonderful professional mounting that cost more than $500! An artful and quite exceptional bronze Tiger, Japan, Meiji, (1868-1912). 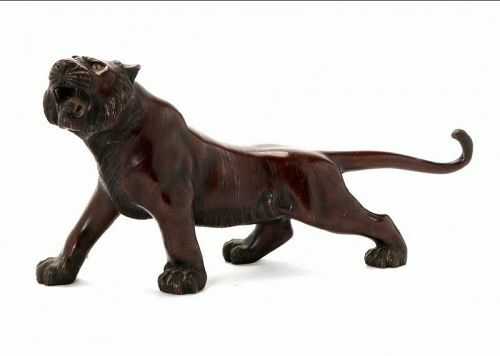 A JAPANESE BRONZE MODEL OF A TIGER MEIJI PERIOD (1868-1912) The patined bronze tiger striding forwards with ferocious expression and tail outstreched, signature to the underside. Exceptional quality casting with it's stripes outlined and yellow glass inlays in the eye-sockets.